A customer holds the electronic cigarette he purchased at a store in Miami. People may think that e-cigarettes are a safer alternative to tobacco, but insurers might not agree. Tobacco use is one of just four things that insurers that sell health plans on the individual market can take into account when determining someone's premium: age, geographic location, and family size are the other three. People who use tobacco can be charged up to 50 percent more than nonsmokers. But 10 states prohibit or restrict insurers from applying the tobacco surcharge in the individual market, according to the Centers for Medicare and Medicaid Services. So the big question will be if insurers end up classifying e-cigarettes as tobaco products. The battery-powered devices simulate cigarette smoking, producing a smoke-like vapor that usually contains nicotine and flavoring agents. 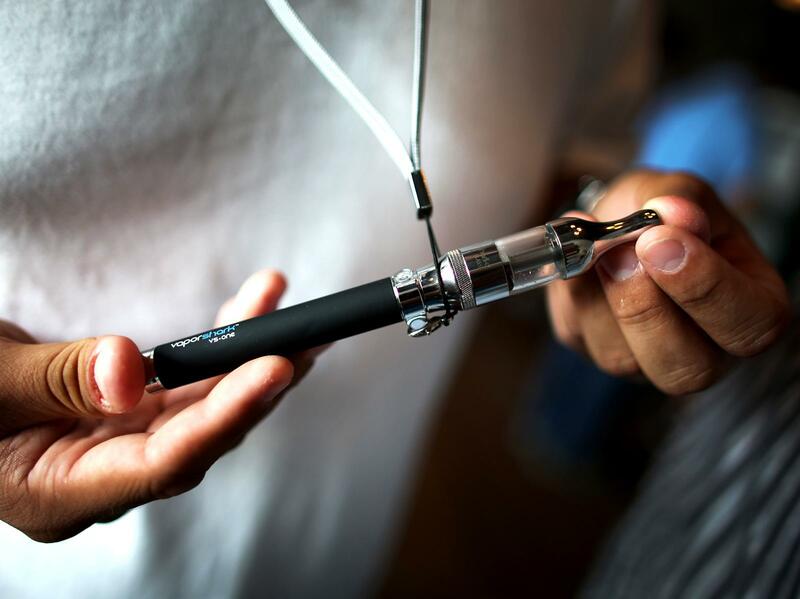 The Food and Drug Administration moved toward deeming e-cigs tobacco products in April when it proposed regulating e-cigarettes, although the proposed regulations aren't as strict as those for regular cigarettes. The Centers for Medicare and Medicaid Services also is looking into the use of e-cigarettes and the tobacco surcharge, according to an agency official. But a lot of this will rest on the science, and the jury is still out the health effects of e-cigarettes. In a recent review of research on e-cigarettes, researchers at the University of California-San Francisco found that although the long-term health effects of e-cigarettes are still largely unknown, they emit potentially harmful substances into the air and can be a source of indoor pollution. Since e-cigarettes aren't FDA-approved for quitting smoking — and in fact are on the brink of being labeled by the agency to warrant regulation like cigarettes — they aren't covered as a free preventive benefit under the law. Clearly more specific guidance will be needed. "The Affordable Care Act does not specify e-cigarette use for purposes of cessation coverage or tobacco surcharge application," says Catherine McMahon, policy principal at the American Cancer Society Cancer Action Network. "The lack of clarity may allow health plans to try to add the surcharge for e-cigarettes."